When I first envisaged the series Mindfulness / Dharma and Climate Action, my primary intention was twofold. First it is important for Dharma teachers to set an example by speaking out about climate emergency. Second, I hoped all of us would be inspired to take the conversation into our local communities and sanghas however challenging that may be. What I didn’t expect was how moving it was to hear each of the teachers communicate such a deep sense of concern with intelligence, compassion and urgency. Through the five conversations with the input of 16 teachers, many topics were touched into which gives us a “library” to continue to draw from. During our last call of the series on Sunday, Ayya Santussika and Ayya Santacitta really brought home the urgency of our situation, while David Loy gave us a very clear template for placing and managing the dire nature of our times. You can hear the whole conversation here. 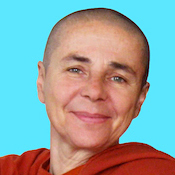 We were sorry that Bhikkhu Bodhi could not join us due to a health issue that morning. However, I really can’t emphasis enough his extraordinary leadership in Buddhist engagement in social justice and climate emergency issues. 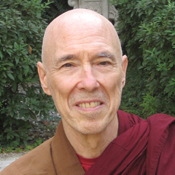 Bhikkhu Bodhi is a guiding star. Please do check out B.Bodhi’s writing and also Buddhist Global Relief which he initiated and which is an amazing organization supporting people across the world who are marginalized and struggling with few resources. David called on us to re-examine our own tradition of Buddhism in the light of the climate crisis, reflecting how difficult it has been to date to bring about a more progressive response to environmental concerns. 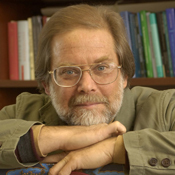 He mentioned that a book he and John Stanley co-edited “A Buddhist Response to Climate Emergency” had been mostly ignored. Going deeper, David talked of an ambiguity at the foundations of our tradition, which really needs to be addressed. 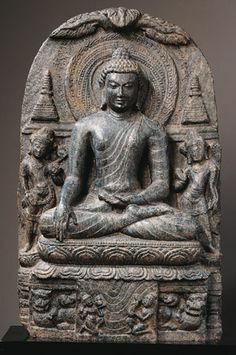 That due to the idea of transcendence, nibbana (peace) becomes a goal that is understood as indifference to the world; so rather than engage the world we check out. He then went on to say that a primary perspective of Westernized Buddhism has been its fruitful interaction with psychology and psychotherapy. That while there has been much good that has come of that, it tends to encourage the idea that “my” problems are in my own head, and if I work on that level then the basic problems of my life will be solved. David pointed out that the danger of both approaches discourages the kind of engagement with the world that we really now need. We also need to understand that in reality our experience of the world is the ways we construct it due to our dualistic understanding that makes us feel separate. Deconstructing a dualistic relationship with the world also needs to be done, not only personally, but also collectively, on a social level — that when we talk of dukkha (suffering) we are not only talking about individual dukkha, but also on an institutionalized level. David finished by pointing out that within Buddhist tradition we have an archetype that speaks directly to what we now need. This is the Bodhisattva Path. Rather than view this in the usual sectarian way, we need to rise about that and realize it offers a particular orientation that addresses the situation we find ourselves in now. What is so special about the bodhisattva focus is it offers a double practice that is actually two sides of the same path. One is our inner practice and the other is outer engagement. It is not enough to settle for inner peace, there is also a need to respond to a suffering world. In finding this balance, while being called on to do the very best we can, not knowing if it will make a difference, we can also practice inwardly. As we begin to wake up and realize we are not separate from the world we move into the bodhisattva path – which involves pretty big vows. While it’s easy to feel overwhelmed, what makes it possible is returning to a place of equanimity or emptiness. This is beautifully articulated in the teaching of Nisagardatta Maharaj, Wisdom says “I am nothing” while compassion says “I am everything” between these two banks, the life of the practitioner flows. Ayya Santussika said she wanted to reflect on what kind of actions can we take as bodhisattvas, putting our bodies, hearts and minds into action. 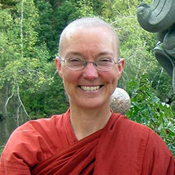 Ayya said her primary focus was on building a Buddhist movement. Why do we need a movement? Because our leaders have lost their moral compass. On a corporate level if they were truthful regards the impact of their products — which is the kind of ethical stance we need to make sure our environment and biosphere is healthy — then we wouldn’t need a movement. Who is it that is meant to ensure that business acts ethically? Ayya said she doesn’t like to say corporations have power; it is the people running corporations that have power. Every decision we make creates karma. If we really understand that and take that in, then we really don’t want to have any investments in fossil fuels, we don’t want to encourage the use of fossil fuels, we want to move away from them as quickly as possible – even though we still have to use them at the moment because we don’t have sufficient alternatives, we what to mobilize those alternatives as rapidly as possible. What we want is governments that protect the people rather than exploit them – governments that keep business in check when its lost its moral compass. However government has lost its moral compass. So when that happens the people have to get together to make their voices heard. We have to rise up! When hundreds of thousands of people demand ethical leadership, then things start to change. Ayya went onto say that right now we are dealing with a lot of misinformation. The idea that governments are doing what they can about climate change is erroneous. If so they would ban fracking and the extreme extraction of fossil fuels. As this is not happening, we have to get involved. Join together with other people of faith such as Our Voices, an initiative of Green Faith, which is organizing to have millions of people sign on, expressing our love for the earth and our children, for all beings. Our Voices is aiming to a) Spread awareness about what spiritual & faith groups are doing. b) Help spiritual groups with their own call to action. c) Organize days of prayer and action. For example December 7th is Light for Lima. Also check out Pledge to Mobilize. When many, many people take actions like this, then those in negotiations are encouraged, inspired and pressured – and that’s what we need to stand up to the billions of dollars in the industry that is furthering the destruction and leading us into disaster and catastrophe. Abraham Lincoln, in his Gettysburg address talked about; “A government Of the People, By the People, For the People” Now we have a government: Of the Billionaires, By the Billionaires, For the Billionaires! 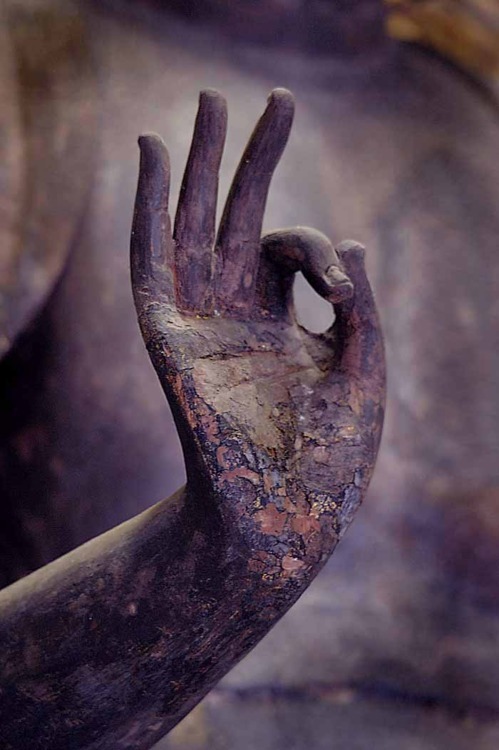 Because of this we need to stand up – to do what we do from a place of practice, of depth, according to the bodhisattva vow – As we do so, to move from a place of connection. It’s a joyful thing to do! Ayya Santacitta followed on by encouraging us to act on what is happening – to make a difference. But we have to start where we are. If we have a sense of despair and confusion, we start with that – but the important thing is that we start – We can no longer be only with our own experience and stop there, we need to see what holds us back from full heartedly engaging the conversation and stepping out. The world at the moment is holding up a very big mirror to us. The way we are living is no longer sustainable. The worldview we have been living in for a long time is clearly not working. A world view based on fossil fuels – we are dressed, eating, living, transporting ourselves within and by fossil fuels – they are all over our life, every where, every corner. On the other hand we want to stay below 2 degrees warming. For that we can only burn 550 gigatons of fossil fuels – but industry has identified 2800 gigatons – about 5 times more. Already we are in a very dire situation. Ayya Santacitta, as did Ayya Santussika, emphasized that we need to organize – to pressure our governments to make clear decisions. We don’t have much time left and we have already gone too far. Making the transitions needed is going to be difficult – we can’t assume this is easy – but we need to wake up to the fact that if we don’t take action its going to be impossible for civilization to continue. It’s simply not going to be possible! Ayya then went on to say that she appreciated contemplating old age, sickness and death of a worldview that no longer serves us – a view that needs to change. To bring this change about we need to demand action from our politicians and support those politicians who are trying to bring about change.